This was our first visit to the Captain Jefferds Inn and the famous coastal community that is home to the Bush family retreat on Walker Point. Long before news of presidential visits put quaint little Kennebunkport on the global tourist map, it was a favorite vacation spot for local New Englanders. 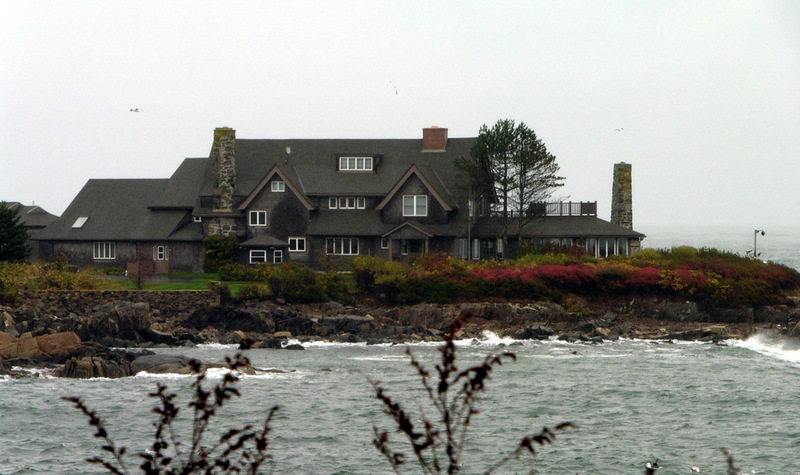 Pounding ocean waves, with seagulls gliding over sand and rocky shores all entreat the visitor to savor the sights and sounds of Kennebunkport, and we were glad to be there. 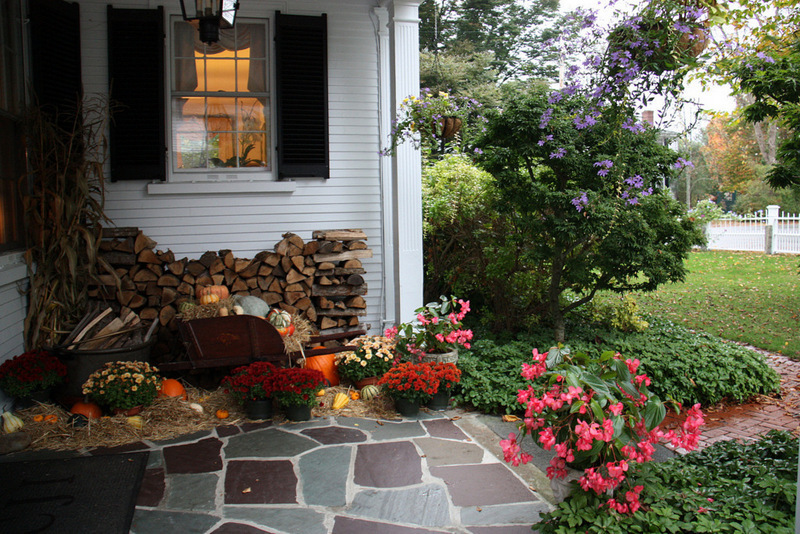 We ran from our rental car to the safety of the dry front porch of the Captain Jefferds Inn. It was a torrential downpour, but the warm welcome from Innkeepers Sarah and Erik Lindblom immediately brightened the otherwise gloomy day. 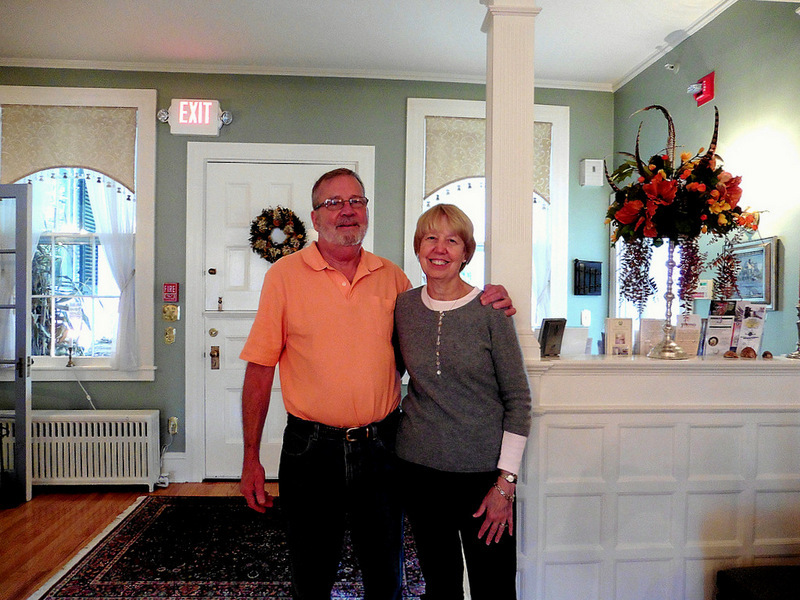 They have enthusiastically greeted guests to the inn for more than a decade and obviously enjoy the activity. 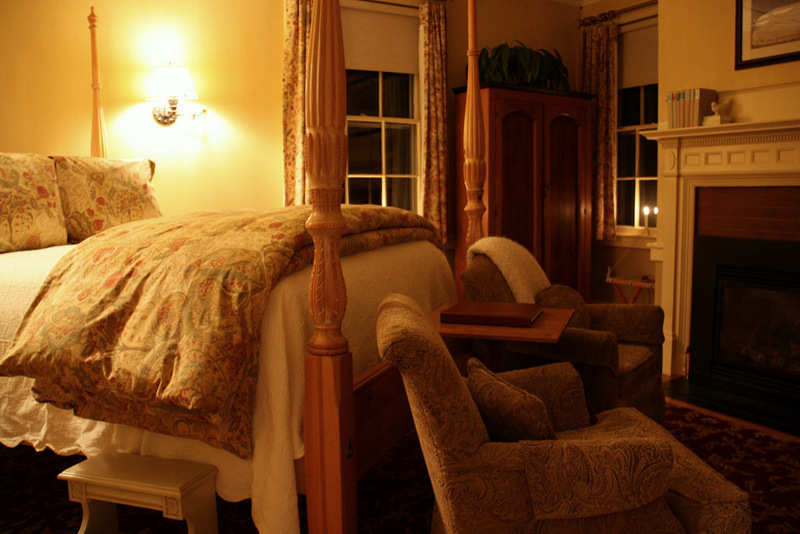 Recommended by a friend, we found the inn to be the perfect elixir for a tiring and wet 2-hour drive from Boston. 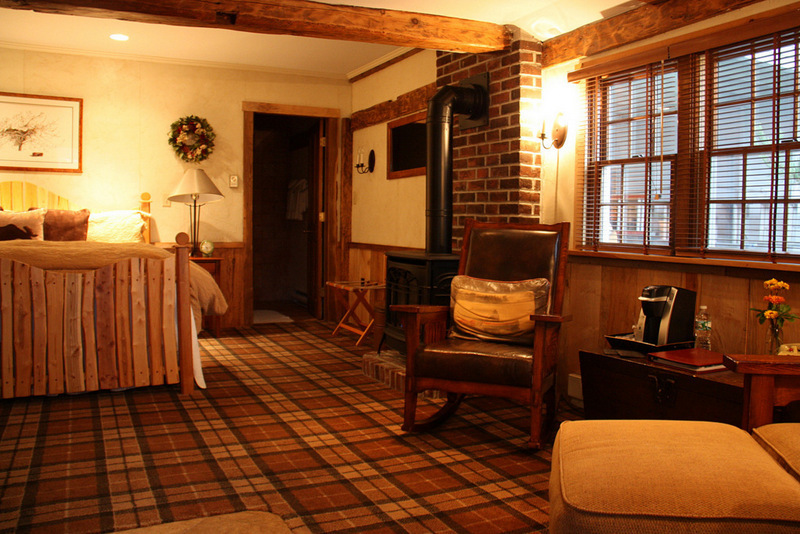 Our one-night stay at the Captain Jefferds Inn provided all the comforts one would expect from such a highly rated B&B in an area of many exceptional B&Bs and hotels. Perhaps it’s the friendly competition that keeps the area’s inns so special and inviting. 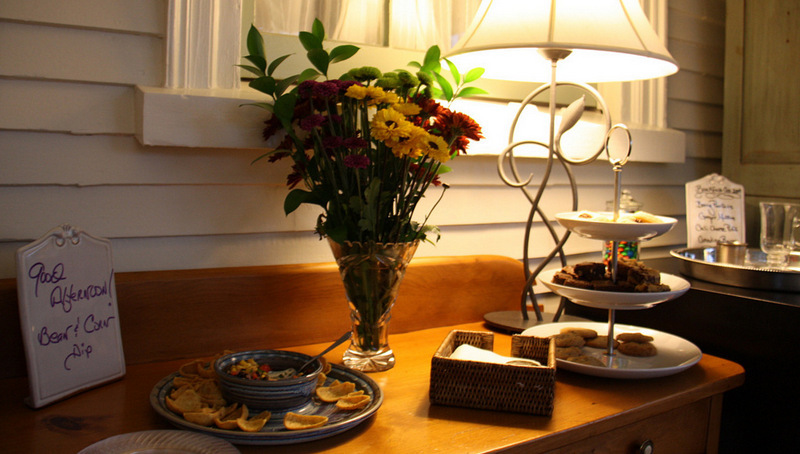 Whatever the reason, we found this inn exceeded all our expectations for comfort and hospitality. The Lindbloms have scrupulously maintained the aura of a home once the domain of a sea captain and his family. Captain Jefferds built his home with the smartness and efficiency of a sturdy New England sailing ship. 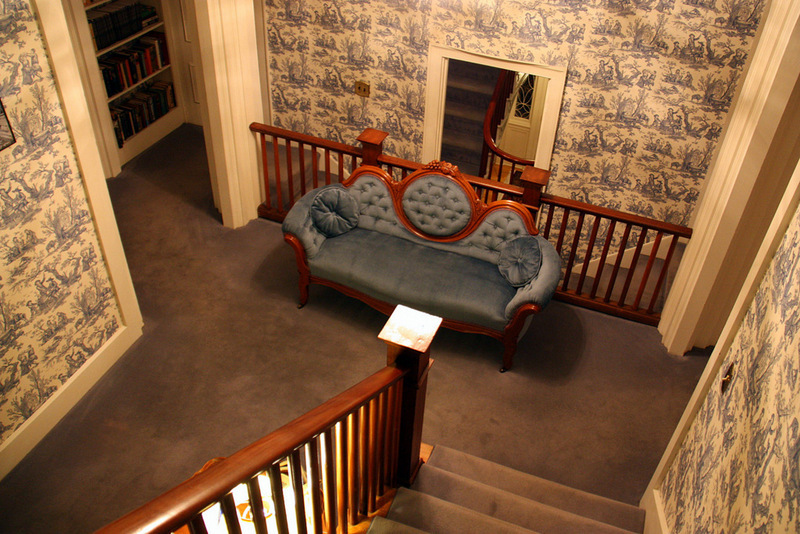 There’s even a removable railing on the stairs to assist in the repositioning of furniture between the multiple floors. 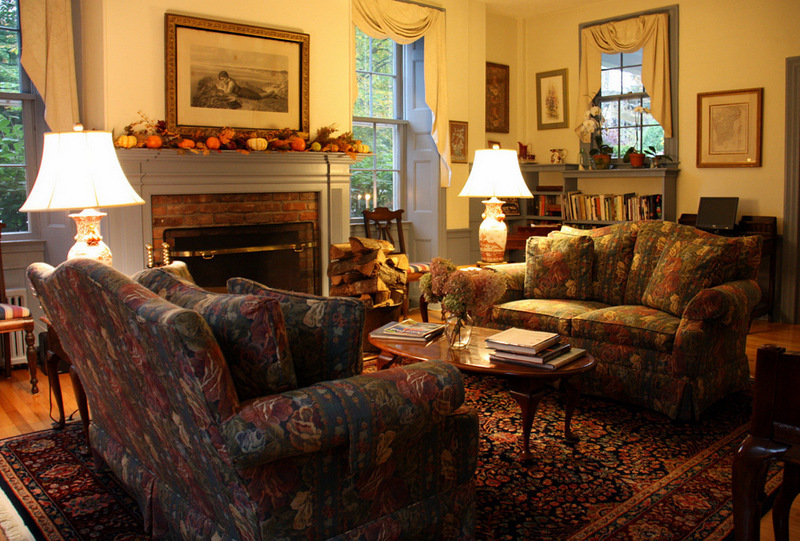 Our room was well appointed with cozy furnishings and a warming fireplace – just what we needed to beat a late October chill. The bed was the perfect balance between support and indulgence, with linens that embellished the vibe. Captain Jefferds has considerately reserved five rooms for those who wish to travel with their pets. Located aside the main house, there is a smaller building, which was once a carriage house. The just-right furnishings add to the charm of these spotlessly clean and elegantly relaxed guestrooms. 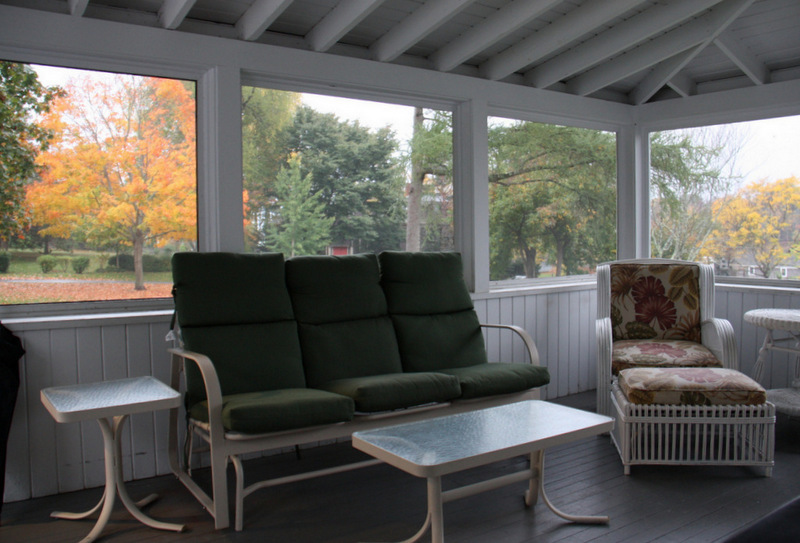 A screened porch, reminiscent of a lake house, overlooks a park like setting and completes the charm of the surroundings. It just doesn’t get any better than this for our furry best friends. 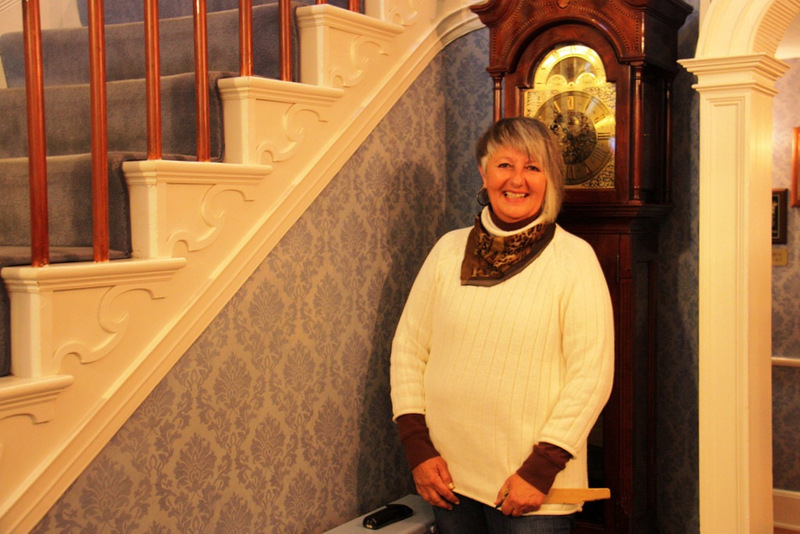 Meet Kathleen — she is the summer/fall Assistant Manager, who gave us a splendid tour of the inn. A practicing nurse, she lives and works in Florida during the winter. 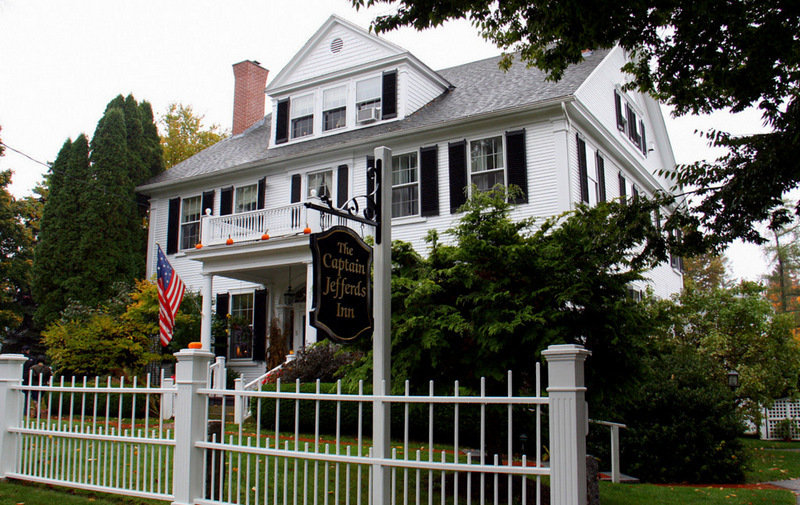 Like the other staff at Captain Jefferds, Kathleen is full of energy and interesting insights about the Kennebunks. 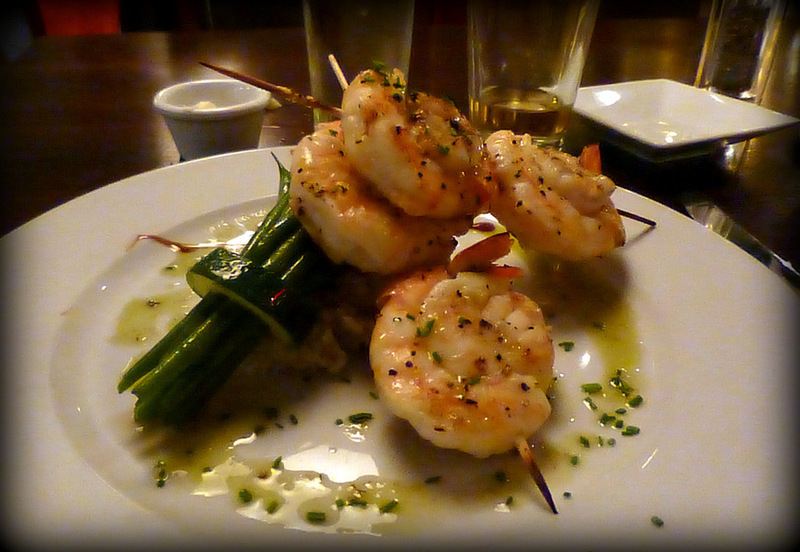 Our innkeepers recommended David’s Kpt Restaurant for our evening dining. 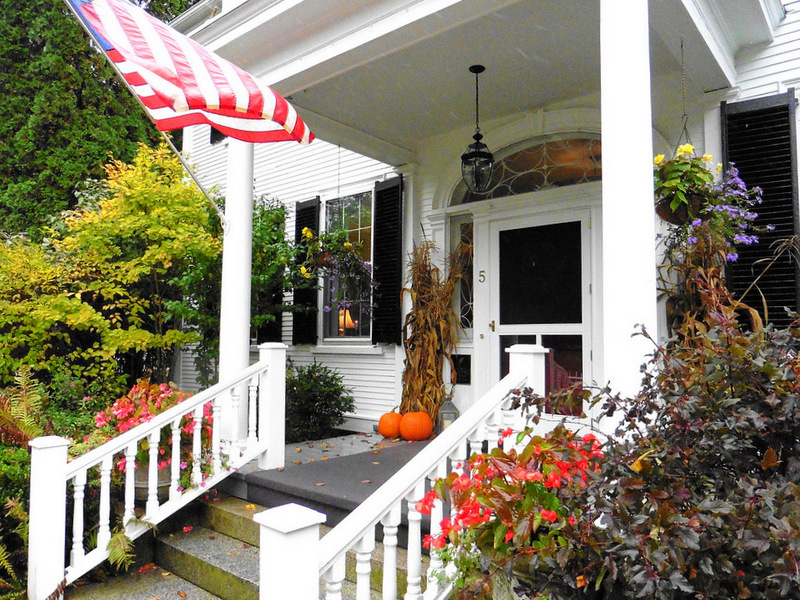 We gathered up an umbrella and walked the few blocks from the inn to the center of the little village of Kennebunkport. We had filled up on the delicious never ending fresh baked cookies and other goodies laid out at the Captain Jefferds’ sun room, so were not interested in a large dinner. We skipped what looked to be an excellent selection of soups, salads, and appetizers at David’s, and went directly to the main plates. The skewers of shrimp and scallops were delicious, and an unusual pairing of pork tenderloin, bacon, and balsamic apples, accompanied by maple mashed sweet potatoes and spinach was a savory treat. We were so content after our entrees that we passed on dessert, but did enjoy a warming espresso before heading back to the inn. 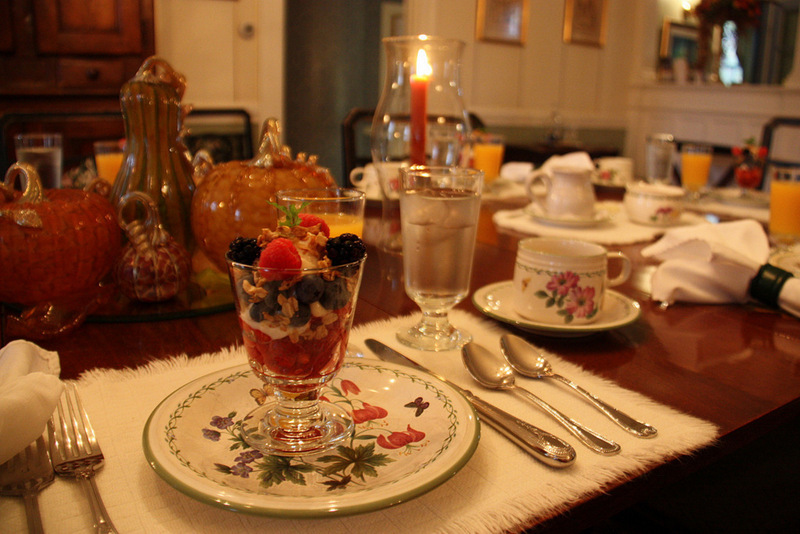 We write about the best B&Bs, so we often experience sensational breakfasts. Notwithstanding previous enjoyments, the Captain Jefferds Inn served one of the finest gourmet day-starting meals in our recollection. 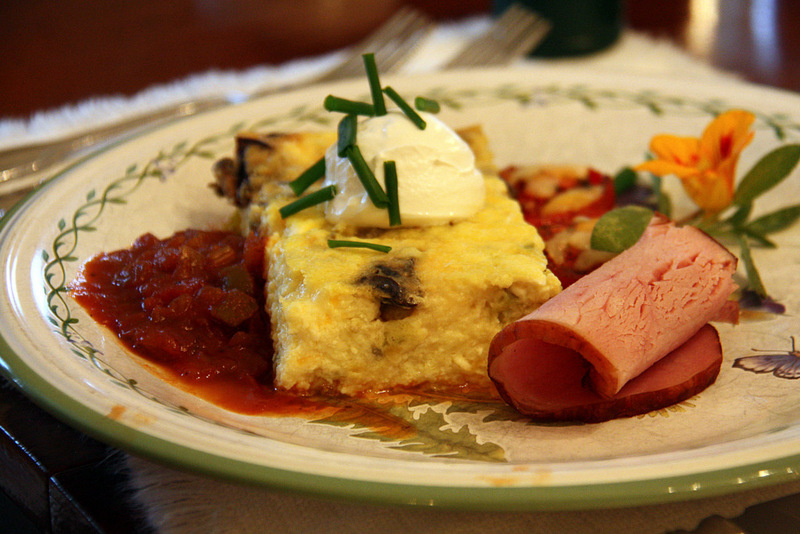 The table was a picture of country food-service sophistication, and the seated breakfast guests anxiously awaited the arrival of whatever produced the tantalizing aromas wafting from the nearby kitchen. Once the serving commenced, the table discussion quickly turned to praises for each of the three-courses served to the delighted patrons. 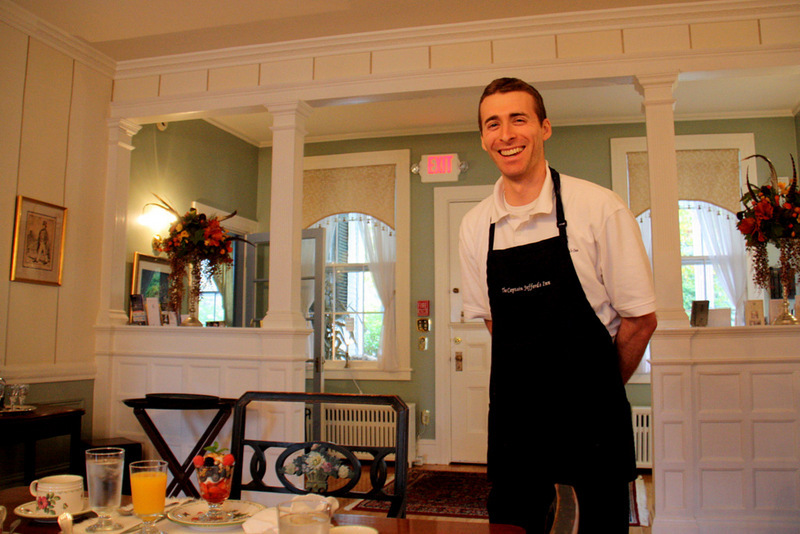 Dan, the inn’s convivial chef, made an appearance to check on the acceptability of the food. We think he knew the answer – and seemed to relish the well-deserved applause. After breakfast, it was time for us to press on to our next lodging in Maine, but before we left we wanted Sarah and Eric to know that we would be describing our experience with tributes. Unfortunately, the heavy rain precluded our visiting and photographing the many sights that bring the tourists to Kennebunkport, but we plan to remedy that happenstance on our next visit to New England. 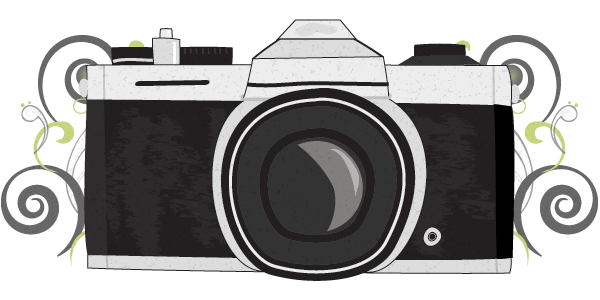 In the meantime, here’s a website of local images by Robert A. Dennis. 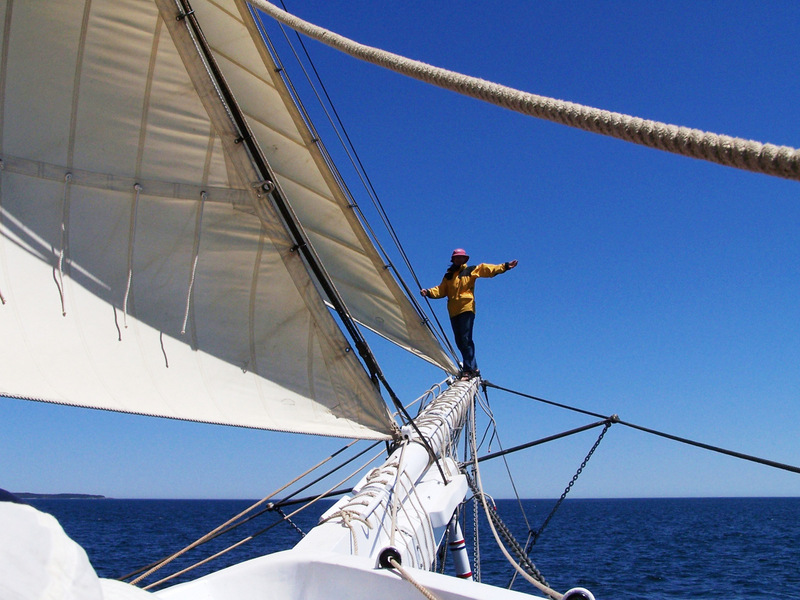 If you think you might like to sail the coast of Maine on a grand tall schooner, read about our adventure here.